Have you checked out that Vita game? You know—the one that's a shoddy spinoff of a big-name series? Perhaps Call of Duty: Declassified, which currently has a whopping 32% on Metacritic? Or Uncharted: Golden Abyss, a game that our Kirk Hamilton called "a cut-rate version of the Uncharted games that most people have already played"? How about Resistance: Burning Skies, which Kotaku boss Stephen Totilo called "a mediocre new first-person shooter that has no excuses for underachieving"? If you've seen a commercial for the Vita, you've probably heard Sony's big tagline. "Get console-quality gaming with the PlayStation Vita." Not a bad selling point, and maybe the Vita does offer console-quality gaming. But it sure as hell doesn't offer console-quality games. Sony's high-powered portable has been around for almost a year now, and the best gun in its arsenal is Persona 4 Golden, a 2012 remake of a 2008 PlayStation 2 game—an excellent PlayStation 2 game, but a PlayStation 2 game nonetheless. The Vita's other top games, while good, are hardly the system-sellers that Sony desperately needs. They're not nearly as varied or deep as the experiences you can get on your Xbox 360 or PlayStation 3. And the Vita's marquee fall game, PlayStation All-Stars, is also available on PS3. When I ask friends and colleagues what they've played on Vita recently, the answer is typically either A. "Oh, I don't have a Vita." or B. "Oh, you know: PSP games, old PlayStation classics that I missed." Nine months in, and the Vita is a PSP, PS1, and PS2 machine. Does that really justify the $250 price point? Sony's portable system has become something of a running punchline in the gaming industry, mostly because Sony has done such a great job of screwing it up. Which is a shame. I really like this machine. It might not be the most ergonomic device in the world—try to hold up the Vita for an extended period of time and your thumbs will start to hate you—but it's sleek, pretty, and powerful. The UI is great, the online features are handled well, and I love being able to play PS1 and PSP games on the go. As a fan of niche Japanese games and RPGs, I had high hopes that the Vita would take after the PSP's success as a platform for experimental, quirky video games. Sony's portable system has become something of a running punchline in the gaming industry, mostly because Sony has done such a great job of screwing it up. But it hasn't. Nobody is buying Sony's new system, not even in Japan, where Nintendo's 3DS recently outsold it 47 to 1. Because of that, developers seem to be shying away. 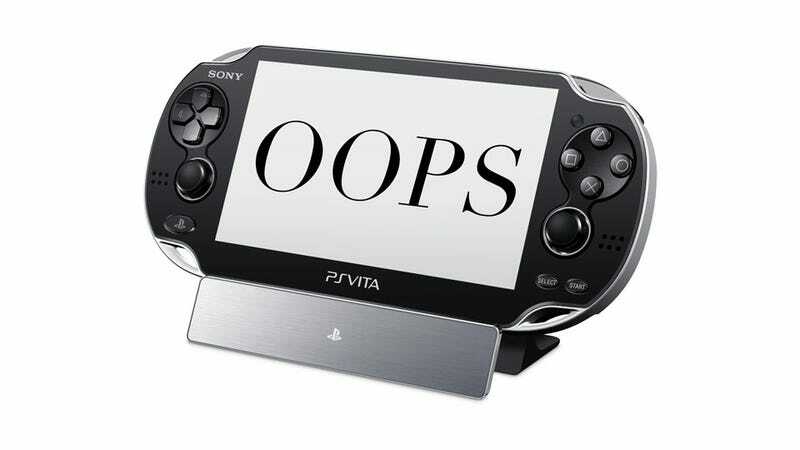 The Vita is floundering, and it's all Sony's fault. The biggest problem is that the Vita has become something of a landfill for bad games, the place to dump off rushed, poorly-made takes on AAA franchises like Uncharted and Call of Duty. This year, Sony has unwittingly cultivated the reputation that a portable system is for shoddy spinoffs—a reputation that it will have to spend the next few years trying to wash off. Even the portable versions of Assassin's Creed and LittleBigPlanet—considered by critics to be solid games—aren't different or special or great enough to make the Vita worth owning for a great deal of gamers. None are better than their console equivalents. None make the Vita feel better than second-class. But that's not the only problem. Sony has also become a victim of its own greed. Last week, Amazon ran a Vita deal that some thought would be hard to pass up: you could get the portable system, Assassin's Creed: Liberation, and a free trial for Sony's fantastic PlayStation Plus service all for $180. Also, a 4 GB memory card. Yep, that's four gigabytes. Or 4,000 megabytes. Persona 4 Golden, in case you were wondering, is 3,137 megabytes. If you intend to seriously download games or other media to your Vita—and you should, because this is a platform built for digital content—you'll need much more space than that. The biggest memory card available for the PlayStation Vita right now is 32 GB. It will cost you $100. That's right. One hundred dollars. When I went to GameStop to buy my Vita a few weeks ago and heard how much the largest memory card would cost me, all I could do was laugh. A hundred bucks for 32 gigabytes? I think I just spent something like $80 on a terabyte hard drive, and now Sony wants me to pay $100 for a card that can hold maybe 7,000 songs? The Vita's memory cards, by the way, are proprietary, which means you're stuck with what Sony gives you. You can't swap in a standard SD card, even if it would be significantly cheaper. That's the gargantuan hidden cost behind the Vita, the purchase that turns that $180 deal into a $280 investment. It's also one of the major reasons that Sony's hot console has received such a chilly reception. It's obscene price gouging, and it will be particularly punishing for early adopters in a year or two, when bigger memory cards are available for even cheaper. Perhaps this wouldn't be as irritating if we could just pretend the Vita doesn't exist. But it does, and it's full of potential: there are a ton of interesting-looking smaller games on the horizon, games like Dragon Fantasy and Tearaway and Soul Sacrifice. Yet other than those few games, the future is bleak for Sony's console. There are few games that could have the type of widespread appeal that will make people feel like they have to have it. The Vita's 2013 lineup is terrifyingly barren, and even if it gets more interesting, I can't help but worry that the Vita's tepid reception has kept game developers away. Why make games for a system that not even 3 million people own when you could develop for the ubiquitous iPhone, or PC, or even the 3DS? I don't make it a habit of caring about how much money Sony makes, and unless you are a Sony employee or shareholder, you probably don't either. But as a gamer, as a fan of the Vita and someone who hopes to keep using it to play interesting, creative games like Dokuro and Zero Escape: Virtue's Last Reward, I really wish Sony hadn't screwed the Vita up.